For the past 12 weeks Sally and I have been training for Eugene. Sally signed up for the marathon and I signed up for the half. We each had business to take care of in Eugene. I wanted to break 1:20 in the half and Sally wanted to enjoy the 26.2 while qualifying for Boston. This Sunday morning we raced Eugene. But the weekend itself was even bigger than Sunday morning. Come along for the ride, I'll try to keep it short. The week before our races was charged. I’ll let Sally tell you what was going on in her mind. But I was swinging between excitement and terror. Lying sleepless for four nights before my race. I had shouted my goals from the internet mountaintops. Twitter, Running Starfish, Facebook, DailyMile… all proclaimed “1:19:__ or bust”. I felt that pressure. Also I had my first elite race entry, which means I didn’t pay to run. I was like a guest, and I wanted to make sure I was a good guest. Which in Eugene, means a fast guest. Anyway I’m sure Oiselle HQ was a real fun place for Kristin, Jacquelyn, and Kerr to be. Fun like walking a landmine field is fun. Questions about the weekend could set off any number of emotions. But we kept the façade of “pure excitement” strong in my opinion. Sunday morning I left West Seattle with Owen; Sally and Lesko left from the East Side. We met at The Nest in Eugene. Yes, that was really the name of the little house they rented. We had lunch and then headed over to the expo at the Hilton to watch the Flomas’ talk (Lauren Fleshman and Jesse Thomas). 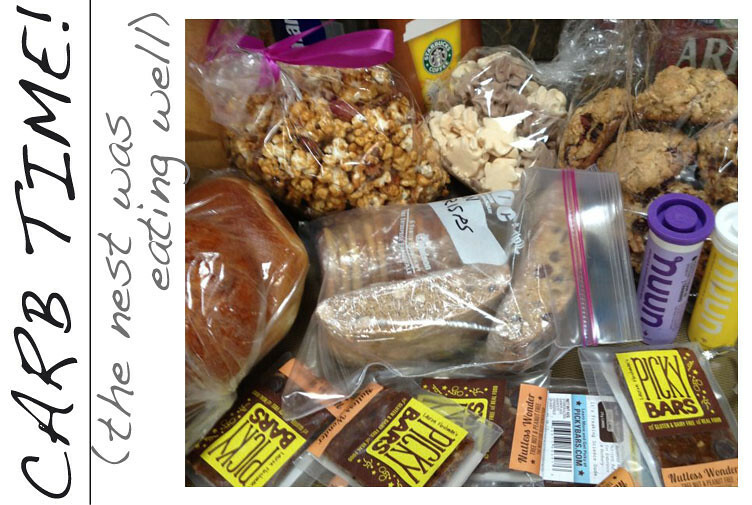 It was an open format QA about nutrition, competition, training, returning from injury, etc. Such a great talk – they are both naturally gracious speakers, funny, thoughtful and interesting to listen to. Owen and I killed some time and then I returned for my first ever ‘Elite Meeting’ upstairs at the Hilton, holy nerves! All these fit people sipping water and eye balling each other. Eeeck. Get me a drink! We learned where we’d meet the next morning and which porta-potties were set up for us, etc. I left feeling like a bundle of nerves/really excited about the prospect of having a warm place to hang out in the next morning since I tend to show up very early. The next hours: bundle of nerves, dinner together, nerves, nerves, ice bath/hot bath, sleep…. Time to see what’s inside. I got less nervous the closer we got to the start, more excited. I’d already done the tough mental work and by race morning had talked myself into this: you put the work in, lets see what you have (and this isn’t the last race on earth). Meb Keflezighi started the race by giving a short talk, then firing the starting gun. I could see him. Just feet from me. Starting our race. I was full of love for the pure sport of running as we all started the race and our individual races. All at once. Here we go. The temperature was great, the course beautiful. I had little packs of men to run with and spent very little time alone. When I felt myself get tense I breathed out the word calm. I held back trying not to go too far under the pace I needed. I couldn’t wait to get to 3 miles out to start to crank as much as I wanted. Of course by then I was hurting more, but still ducked under 6:00 pace for the last miles. I crossed the line at 1:19:11. 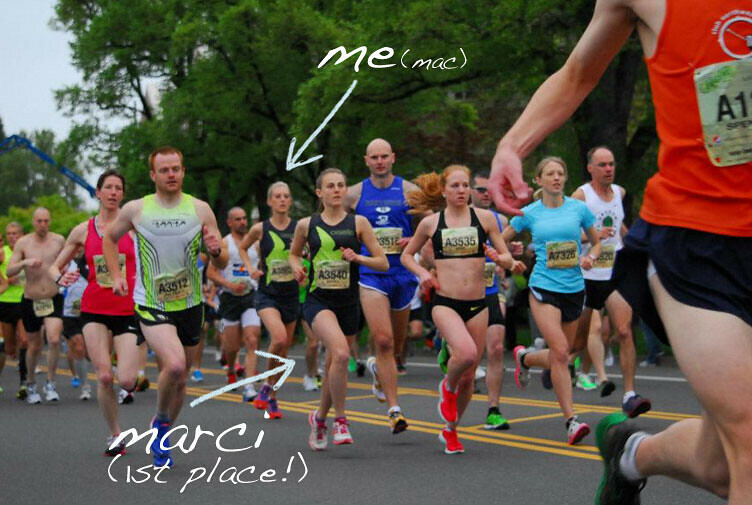 High fived a pancake, yes really, congratulated Oiselle runner Marci Klimek on her win! And got back on the course to cheer for Sally. Sally wasn’t with the pace group I expected, and I began to worry. But then there she was, hamming it up slapping her hands onto her quads, which I assumed meant 'oh crap my quads are shot'. Which it did and they were. But she hung on, still BQed and, as seen in these pictures from Meghan's blog, did have some fun along the way. We were all left Hayward relieved to rest before a fun night out with none other than Lauren Fleshman and Jesse Thomas AND Meggie Smith. Tweet up! The best part of the weekend aside from crossing that finish line was meeting so many people in real life (or IRL as the kids say) for the first time. We had Meghan on the course cheering in a borrowed Banana suit! 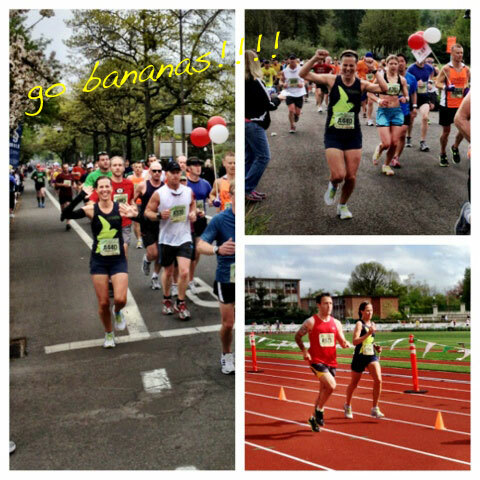 (Sally put 'bananas' on her bib number instead of her name so people would cheer GO BANANAS! Check out Meghan's blog post Operation Go Bananas for more on that.) 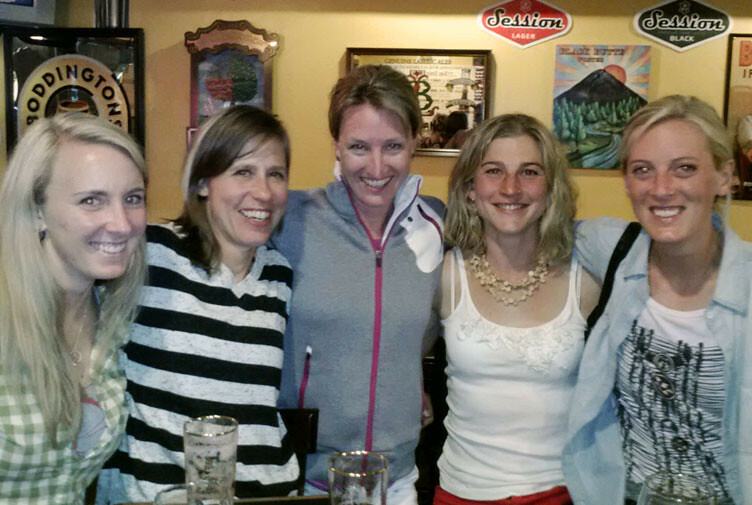 We got to hang out with Meggie Smith, a Oiselle runner, who was just as much fun as I imagined. We got to shoot the breeze with Lauren Fleshman (seriously?!?!) and Mr. Fleshman. And I got to spend the weekend with lots of my favorite people. Let’s just say it was hard to come back to reality...but great to know that on June is just around the corner. OLYMPIC TRIALS!! !